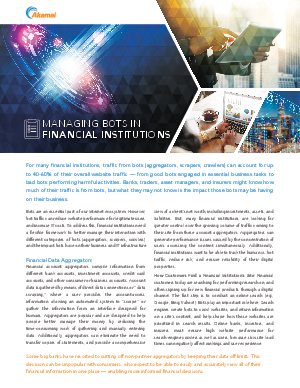 For many financial institutions, traffic from bots (aggregators, scrapers, crawlers) can account for up to 40-60% of their overall website traffic — from good bots engaged in essential business tasks to bad bots performing harmful activities. Banks, traders, asset managers, and insurers might know how much of their traffic is from bots, but what they may not know is the impact those bots may be having on their business. What a good bot looks like?